* Drag-and-drop PDF creation (NEW). PrimoPDF is the only free PDF converter to support one-click, drag-and-drop PDF creation -- saving you time whenever you need to create a PDF file. * Downloaded 15,000,000+ times. PrimoPDF is the world’s most popular free PDF creator. * 100% industry-standard PDF files. Easily create PDF files that can be opened in any PDF viewer, including Adobe Acrobat, Adobe Reader, and Nitro PDF Professional. * Convert 300+ file types to PDF. Convert any file that prints to PDF, including Microsoft Word (DOC, DOCX), Excel (XLS, XLSX), PowerPoint (PPT, PPTX), Visio (VSD), Publisher (PUB), WordPerfect (WPD), OpenOffice, HTML, TXT, BMP, TIFF, JPEG, GIF, PNG, and many more. * Consistent PDF creation. Use PrimoPDF’s creation profiles to produce the same kind of PDF file every time. Profiles include Screen, eBook, Print, Prepress, and Custom. * Append PDF files. Combine each newly created PDF file into the one PDF. * Secure PDF. Protect and encrypt your information with strong password-based PDF security. * PDF metadata. Set the document properties information fields, -- including author, title, subject, and keywords -- to index your PDF files and make them easier to search. Today marks a milestone in the Defraggler product history. After nearly a year of development and testing, we're proud to release the first test version of the new Defraggler v2.0! This new release pushes the capabilities of Defraggler far beyond any other free defragmentation tool, by offering complete offline defrag during the boot process with full OS support. Additionally the UI has been improved with a new Drive Map and customizations. We've also rearchitected the internal defrag processes to make it faster and more efficient! Download Defraggler v2.0 beta now from our Download Center. First right-click on the red BitDefender icon near the system tray choose on Exit. Wait a few seconds. Afterwards double-click on the BitDefender uninstall tool. You will need to reboot your computer for the changes to take effect. made just the way you like it. I wanted to use these o/s simultaneously,so this is the result. Unzip the the Ubuntu-9.04-1gb.tz file to C:\coLinux. This will take a while (unpacked it will be 1G). Unzipped, the file will have the name Ubuntu-9.04.ext3.1gb.fs. The images that coLinux provides may not be big enough for our needs, especially if we plan to install Gnome or KDE. Here's a nifty little program we can use to increase the size of the image file: toporesize.zip. Toporesize can be found on Colinux Image Tools. KPI Library is a community of performance management professionals. Looking for best-practices in performance management. Search in more than 2500 KPIs (also known as business metrics, performance measures, business indicators) by process or industry. : The Real tips and Tricks maintain high eCPM and maximize the "Adsense Revenue"
I found that there is no people could actually explain how to get a good eCPM. Some say increase your traffic of your site, and there is a silly post that removing your pud-ID when the eCPM is low! In my opinion, those are useless tips. For increasing a website's traffic matter, it is actually every adsense client's major problem. Unless your site has new interesting content everyday, otherwise, it is very hard to keep increasing the traffic all the time. For the one about remove the pub-ID from the code, I do not know if it is true since I have never tired, of course, it is a pretty big project to remove every page's pub-ID from the ADsense code. Also, it is not effective for adsense user could earn for only every another day. For those basic knowledge, such as using match colour, using good scale layout and filtering your ADs, i am not going to talk about here, since I believe those are common sense to every Adsense user. 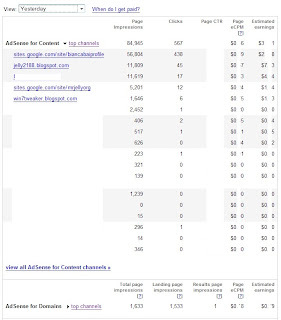 Adsense is a very smart real-time system, it controls what ADs are going to show in your site. The major factor of eCPM that no one is talking about is "link" matter. Both link-in and link-out determine your eCPM. You need to know that the site you linking out or in is "google friendly" or not. For example, sites of micro$oft and f@cebook are not Google friendly sites. Linking to them will lower your eCPM. Even your drive people to your site from them, those vistors will show low value ADs. On the other hand, linking to youtube.com and blogger.com could maintain a high eCPM. The easilest way to find out if the site is Google friendly is checking out if they are using a google search engine for their site. Clicking your own AD by mistake would seriously effect your eCPM. Hope this post could tell you some sense of the adsense system. PS. If you want the full version of the picture, please follow me and I will send it to you. BBC News is the department of the BBC responsible for the gathering and broadcasting of news and current affairs. The department is the world's largest broadcast news organisation and generates about 120 hours of radio and television output each day, as well as online news coverage. The service maintains 44 foreign news bureaux and has correspondents in almost all the world's 240 countries. Since 2004 the Director of BBC News has been Helen Boaden. The department's annual budget is £350 million; there are 3,500 members of staff, 2,000 of whom are journalists. Through the BBC English Regions BBC News has regional centres across England as well as national news centres in Northern Ireland, Scotland and Wales. All regions and nations produce their own local news programmes and other current affairs and sport programmes. Radio and television operations are broadcast from BBC Television Centre in West London though are set to move to brand new facilities in the newly extended and refurbished Broadcasting House in Central London in 2012. Television Centre houses all domestic, global and online news divisions within one main newsroom. Parliamentary coverage is produced and broadcast from studios in Millbank in London. Criticism of the BBC in the United Kingdom has generally taken the form of accusations of political bias from across the political spectrum, although the BBC is a quasi-autonomous corporation authorised by Royal Charter, making it formally independent of government. Internationally the BBC has been banned from reporting from within some countries who accuse the corporation of working to destabilise their Governments. In 2005 BBC News celebrated 50 years of news broadcasts. BBC News journalists, cameramen and programmes have won awards over the year for reporting, particularly from the Royal Television Society. The BBC founded the BBC College of Journalism in 2005 as a part of the BBC Academy, following recommendations made after the Hutton Report. Wanting to disable the splashscreen in office 2010? 1.Right-click on the desktop. 2. Click New and select Shortcut. 3. Click the Browse button and go to the Word executable (“C:\Program Files\Microsoft Office\Office12\WINWORD.EXE”). 4. After the full path and the end quotes, add one space and type in /q. 6. Type a name for the shortcut. 4. After the full path and the end quotes, add one space and type in /e. 4. After the full path and the end quotes, add one space and type in /s. 3. Click the Browse button and go to the Word executable (“C:\Program Files\Microsoft Office\Office12\Access.EXE”). Apparantly, some people have had problems with this issue, going back to Office 2007, when an upgrade has be performed, but not all programs in the Office suite are upgraded (ie, you have an older program from a previous suite still installed on your computer ie. you upgrade to Office 2010 Home & student, but your 2007 installation had Outlook, and the version of Outlook on your computer is 2007). If this is the case, one fix is to create a new registry key for each of the 2010 applications installed on your computer. Open regedit by pressing Windows+r, and typing regedit in the Run dialog box. Select OK, and approve the UAC warning if you are presented with it. IMPORTANT: Please first back-up your registry before proceding, by highlighting 'Computer', selecting File>export and create a copy of the registry on your desktop. This way, if you have any problems, you can enter safe-mode, and reinstall a copy of your registry before this change. You will need to do this for each Office 2010 app you have on your computer. In the Run dialog box type: 'reg add HKCU\Software\Microsoft\Office\14.0\*OFFICE APP NAME*\Options /v NoReReg /t REG_DWORD /d 1', replacing *OFFICE APP NAME* with the office applications on your computer (Word, Excel, Powerpoint...etc) without the quotes of course. restart your computer, and attempt to open an office program. This solution works for most, but there are some people where this is not enough, and a long process of allowing permissions for different parts of all the applications is required. Try the simple fix, and report back. U.S. hunter Mary Beth Harshbarger has been found not guilty of criminal negligence causing death in the 2006 shooting of her husband in central Newfoundland. The Pennsylvania woman has always claimed she mistook her husband Mark for a bear. Google URL Shortener Blog: "Hello World"
Then you were so mad to turn the table upside-down? come on, this is a for sure method solution to fix it. This is often done for the test hardware will be of great help friends! !